Interesting places, products and dishes I am coming across while traveling through Canada, the USA and other parts of the World .... who knows, I may get you interested into trying something new today! I don't know about you, but I like fish and chips. A nice piece of fish, thinly battered deep fried, crispy chips, some coleslaw and some tartar sauce and we are happy. But what do we usually get? : an over-battered piece of previously frozen fish, soggy fries, a prepared slaw and one or two pre-packed little cups of oily tartar sauce (imitation), right? The price doesn't usually indicate, what we will find in front of us a little later after ordering - to late to be sorry for the decision. Not here, at the Whaler Restaurant down at the pier in Red Bay, Labrador. Just across of the&#160; interpretation center of Parks Canada that exhibit the early days of whale hunting by the Basques here on the East coast of Labrador. Entering the restaurant you will find a nice, clean setup and nicely decorated without being tacky. At one side the entrance to the gift shop, at the other a small exhibition of memorabilia of the Grenfell heritage. This place was recommended to us by a local storekeeper with the suggestion not to miss to try their Fish and Chips. And how right she was: The plate was $ 12.95 and we were assured that we will get freshly caught by a local fisherman Cod with homemade fries. The plate locked beautiful - not overloaded but just nicely presented but more important it was a delight. The fish was fresh, moist and the batter not thick and soggy but light and very crispy. So were the fries accompanied by some homemade slaw and a refreshing tartar sauce. If you ever have the chance to go and visit Red Bay, Labrador don't miss the two places: The National Historic Site about the whale hunting and the Whaler Restaurant - you will certainly remember this day a long time after. The Royal Canadian Legion in St. Anthony in the northern part of Newfoundland is holding a good old-fashioned Newfoundland scoff (and this is not another word for bar fight) ever Wednesday during the summer month. From 4 to 8:30 pm a delicious supper with traditional Newfoundland dishes will be served while enjoying live entertainment. We just couldn't miss the opportunity to go and we just had so much fun. This Wednesday they served either a Jigg dinner or Fish and Brewis. The Jigg dinner consisted of various root vegetables and a piece of salted pork as for the fish and Brewis was a platter of Cod fish and a re-hydrated bread cake (if you are interested the recipe is at the end of this blog). We enjoyed that these were traditional dishes cooked by regular people like you and I and not "touristified" by a Chef in a "bus-stop restaurant". They were rather bland but there was salt and pepper on the table to season them to our own taste. Beside this food experience we got Screeched in and became honorary Newfies together with 16 other participants - if you get a chance to become initiated don't push it away! It's called Screeched In from Newfoundland Screech - the rum that's used as part of the procedure. Screech was once a colloquial term to describe almost any cheap high alcohol spirit but now it is a top selling brand of rum. You have to dress like a Newfie, eat like a Newfie, speak like a Newfie and drink like a Newfie: At the initiation you may end up to be dressed in yellow fishing gear, eating capeling (dry, salted small sardine-like fish), Newfie steak (Bologna ... ) and bread & molasses, bottoms-up a shot of Screech and kissing a Cod. This all while learning to speak like a Newfie. At the end you will most likely take home a bona-fide certificate confirming you as an honorary Newfoundlander. To prepare with SALT FISH: Skin dried salt fish, cut fish into serving size, cover with cold water and soak overnight. Next day change water and bring to a boil for 20 minutes or until fish flakes with a fork. Drain, remove fish bones. Combine fish and prepared hard bread (Brewis). Serve with "Scrunchionus" (small cubes of fat back pork fried to golden brown). Use as a gravy over Fish and Brewis. To prepare with FRESH FISH: Cut fish into serving pieces and place in bake-pot with fat and scrunchoise. Bake for 15 - 20 minutes or until it is cooked and remove the bones. Combine the coked fish with prepared hard bread (Brewis). One thing that hit me while travelling through Quebec is the little convenience stores (called "Dépanneurs"). Every city, to own and village has them, lots of gas stations are also able to sell food, tickets, smokes but also wine, liquor and beer. The dépanneurs acct as the empty bottle returning places as well as the store, were you may find local artisan products like fresh bread, cheese or more. You may wondered, why there were new blogs now for a while. Thing's got very busy in my life and while I was still finding new and interesting food-related places and products, I was just not able to create articles. Between quitting my job at the bank, moving out of the rented house putting most of our belongings into storage and equipping a 5th wheel for our long trip time was just running away. Now we are a little over two weeks into our new life on the road and things start to settle down. Still have to do some catch-up on certain paperwork and on this blog, but I feel that it will get better from here on. Thank you for hanging in there and still checking this blog out ones a while. Canadians have a lot to celebrate when it comes to home grown food. In addition to supporting local farmers and growers when you shop, you can also choose local foods from each of the four food groups. Vegetables and Fruits: Canada grows a wide variety of vegetables and fruits , including apples, asparagus, blueberries and potatoes. With spring on the way, look for local asparagus, peppers, and greenhouse tomatoes in your neighbourhood grocery store. Remember, vegetables and fruits provide plenty of vitamins, minerals, and antioxidants, and it is important to enjoy 7-8 throughout the day. Grain Products: Canada produces a variety of different grains including wheat, corn, oats, barley and buckwheat. These tasty grains are full of vitamins, minerals, and fibre. Eating Well with Canada’s Food Guide recommends you make at least half your grain servings whole grains everyday day. Start your day with a bowl of oatmeal for breakfast; substitute whole-wheat flour for white flour when baking, and enjoy whole grain rice or pasta at dinner tonight. Milk and Alternatives: There are over 13,000 Canadian dairy farms supplying Canadians with milk everyday. Milk provides protein, along with important bone building nutrients like calcium, magnesium, phosphorus and Vitamin D*. For a great snack option, try Frozen Yogourt, its low in fat and made with 100% Canadian milk. Or just a string of cheese as a healthy snack together with a fruit for example. Look around next time you go shopping and you will be amazed how much Canadian food is available in the shelves of the stores. What is Golden Beef? Golden Beef is a unique premium beef product produced by a small group of dedicated farmers in Northern Ontario. Our cooperative is devoted to producing a healthy, leaner beef alternative. Golden beef are raised without the addition of growth promoting hormones or antibiotics. Golden Beef is raised on forages such as pasture, hay and silage. Since no grain is fed to Golden Beef animals, there is no impact on the use of grain for human food and shipping of fee is eliminated therefor reducing the consumption of fossil fuels. We were lucky to find some Golden Beef at the Delaney Bay Cheese Market here in North Bay and, to try it out, got some shanks and some ground beef. Wh at a great experience: The meat is leaner than conventional beef and tasted different. Since it is from younger animals it is also more tender. I will certainly go back and get some more in the future. Cooking needs to be adjusted to the difference in fat-content and tenderness. I invite you to go and try it out - I am sure that you will appreciate the difference. On Thursday, March 29th I was on the road shortly before lunch hour and decided to check out this little place in North Bay: Colonel Hoagie on the corner of Hwy 11 and O'Brien St.
First impression: The parking lot was already well filled and that was about half and hour before noon. Same inside: Quiet a lot of tables already taken and people eating or waiting for their order. Even so, the service was quick and without hectic. The decoration on the walls reflect the time of rock 'n roll, Pepsi and Elvis with some memorabilia like Route 66 plaques. Everything just matches: From the simple table settings to the decoration to the style of the menu. The choices are plenty: Classic 50s food, hamburgers, all day breakfast and great lunch platters. I was in the mood for a hamburger and choose some putine with it: Wait time was very short and the plate came with plenty of food and a side of backed beans. Everything tasted great: Good fries, juicy burger and tasty putine. Only little suggestion is, that I expected my putine to be a little hotter (temperature wise) - but in the end an overall great lunch. Just a little detail: Even everything was well seasoned, you'll find beside ketchup, mustard, salt and pepper also some seasoned salt in a small shaker on the table .... nice detail. As a regular visitor to this place said just perfectly: "Colonel Hoagies is always full. Very popular place. Good food and fast service." 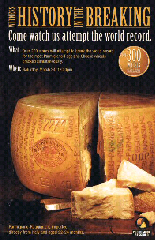 On March 24, 2012 at 12 noon 200 stores will attempt to break the world record for the most Parmigiano-Reggiano Cheese wheels cracked simultaneously. In North Bay one of the participating stores will be Dollar's Your Independent Grocer. On Friday the Toronto Wine and Cheese Show will open its doors at the International Center. I always wanted to visit this exhibition - and this year we are going to do just this. Together with our friends we have planed a trip to T.O. with shopping at Brandt Meats and Dimpflmeier bakery, visiting the food show and do more stops at IKEA and Costco. 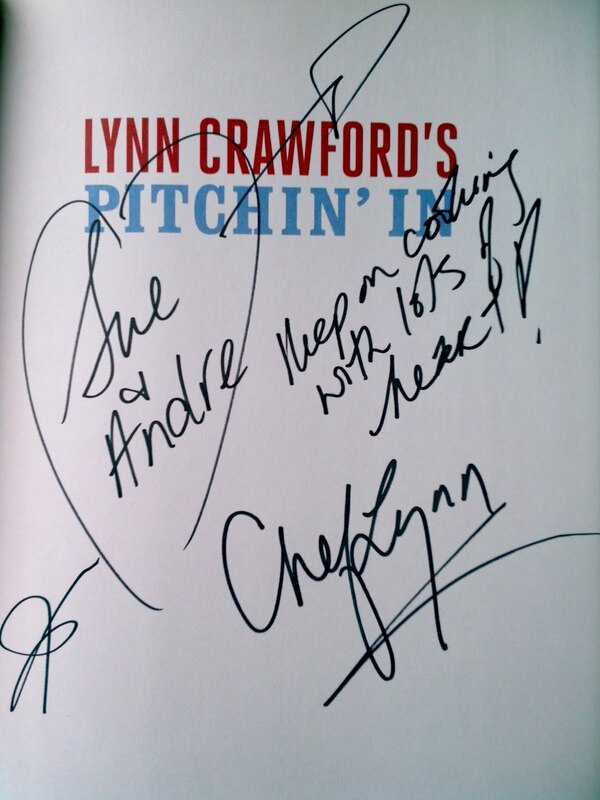 Hopefully we get a chance to see TV Foodnetwork Starchef Lynn Crawford on Saturday afternoon. 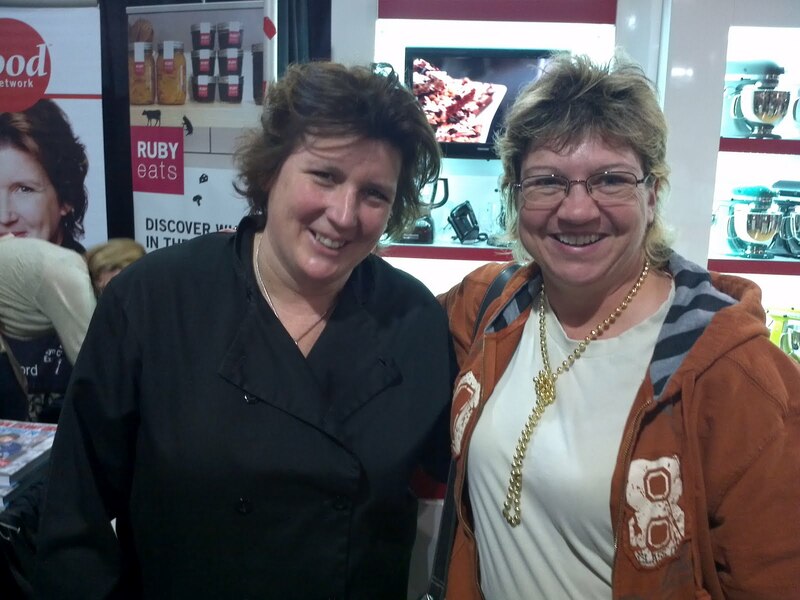 As you can see on the pictures we had an opportunity to meet Chef Lynn - what a pleasure this was. 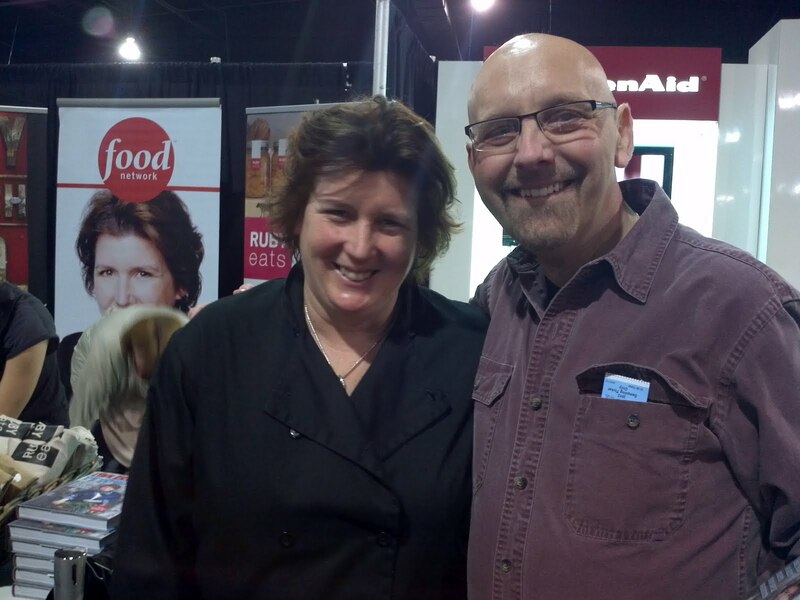 She is so approachable and inspiring as you know her from her show "Pitchin'In". 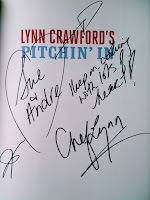 She even personally signed her latest book for us! Just read this in www.eatsmart.de and I am sure that it can't be taken to serious. It is a short article about dos and don'ts on the table around the world. Some place you suppose to make noises while eating, othernplaces you are not to cut the bread but to break it. Going out with friends for dinner no need to wish each other to enjoy the meal like happening in the old world - the waiter will take over that duty after serving the last person of the group - now that's service, isn't it? Again a difference between Old World and North American table manners: Should one have to go to the bathroom during the meal this should not be mentioned while leaving the table in the "New World" - it is enough to say that you will be right back. In a lot of Islamic countries as well as in India and Thailand people eat with their hands. Dishes are served on one large platter and everyone can serve himself. One thing is tabu in these countries: The left hand is not to be used to take the food since it is considered "dirty". People clean themselves with this hand and even the hands are washed before a meal and sometimes even in between the different courses. Spaghetti without spoon and Baguette without knife: The French loves his Baguette bread. But bread will be broken and not cut - they will use the knife for other food like fruits but not to cut bread. In another country of Europe - Italy the use of a spoon to eat Spaghetti is not correct. This past should be eaten with a fork only: No cutting it, not biting it off and no spoon! So, make sure that you don't overload your fork when starting loading it with this traditional pasta dish. If you finish your plate in Russia you signal to the host, that you are not full and would like more. Best to avoid to get seconds or thirds is to leave just a small amount of food on your plate - it will show your host, that you are full. As you see, what's considered impolite in certain parts of the world may just be the right thing to do in other places. Best is to find out ahead if possible. Also, some families may have their own little rules and procedures they follow. I am still working on this blog - trying to find a good beginning and the right mix. I guess I just start somewhere and see, where this will lead me. Food offers such a wide spectrum to explore and to write about: From individual produce and productions to preparation, from history to tasting today, from supply sources to interesting TV channels, .... you get the picture. I will try to find a good mix amongst all these various channels. From someone who underwent Gastric Bypass Surgery and in the process lost over 180 lbs (about 80 kg) over the 2 - 2 1/2 years following the procedure you wouldn't expect such interest in food - but that's just me, I am still very interested and may be even more today because I am looking at it in a different way. So, please keep checking back and if you have any suggestions feel free to contact me or leave a comment. The world became a village and with that the accessibility to exotic food increased. But not only exotic food is interesting - going back to the roots or to local offerings have gained in popularity. New boutique-like store offering specialties like artisan cheeses, organic and locally grown herbs and produce and much more are opening close to you. I am looking forward exploring them, use the products offered or just share recipes with you. André Rieser. Theme images by hatman12. Powered by Blogger.